This was The Isley Brothers' first album after leaving Motown. In 1969, groups like The Temptations and solo artists like Isaac Hayes were showing that soul artists could put out credible albums, as opposed to ones made up simply of just singles and cover versions. 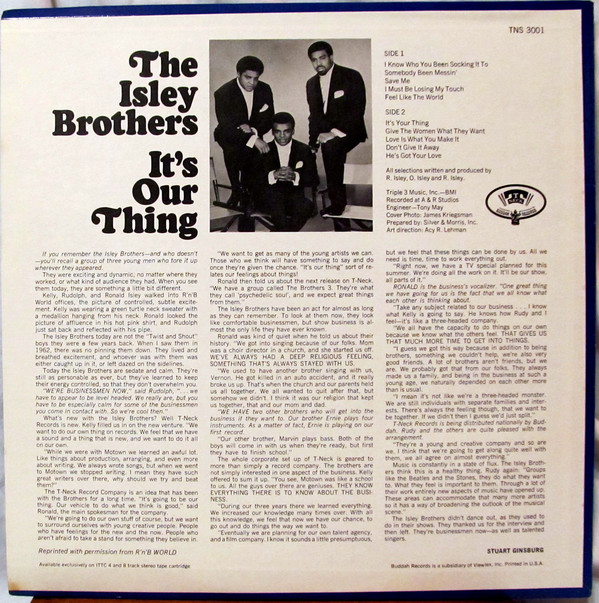 The Isley Brothers got in on the burgeoning urban funky soul thing as pioneered by Sly & The Family Stone and James Brown. This was their first stab of going funky, brother. It was a success and, notably, it still retained some of that Isley Brothers flair and musical creativity too. It is only twenty-six minutes long, however, which is short, even for the time. "I Know Who You Been Socking It To" introduced us to the new, funky Isleys, with a deep, chugging slice of urban, brass-powered funk. The same brass dominates the Sly Stone-esque "Somebody Been Messin'". "Save Me" slows the pace down on a soulful ballad. Those Stax-style Memphis horns still drive the track along, Otis Redding fashion. It has a great soul vocal. "I Must Be Losing My Touch" is a wonderful, stomping number with a pounding, bassy sound and infectious beat. "Feel Like The World" is a slower tempo soul ballad. 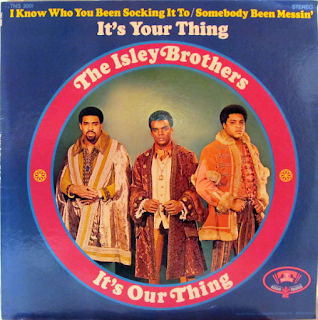 "It's Your Thing" is the best known track, one that appears one several funk compilations. The Temptations covered it on their "Puzzle People" album too. It has great hooks, both vocally and brass-wise. "Give The Women What They Want" is a big, rumbling piece of contemporary funk. Once again, it is thumping and brassy. The women need love, by the way. "Love Is What You Make It" is a sweet soul number to cool down the ambience a little. "Don't Give It Away" has an intoxicating, funky rhythm and Ernie Isley starts to me himself known on guitar throughout. "He's Got Your Love" ends on a punchy note with an upbeat, grinding soul number. Again, there are snatches of rock guitar riffs which give a hint at the future. This album started "phase two" for the Isleys, where they threw off the Motown shackles and became a serious group in their own right. Not that they hadn't been, their music had been great, but you felt that here they were doing what they wanted to do. The instrumental versions on the extended remaster are excellent. The sound quality on the remaster of the original album is ok, but not truly outstanding, as the original source tapes probably still contain flaws.